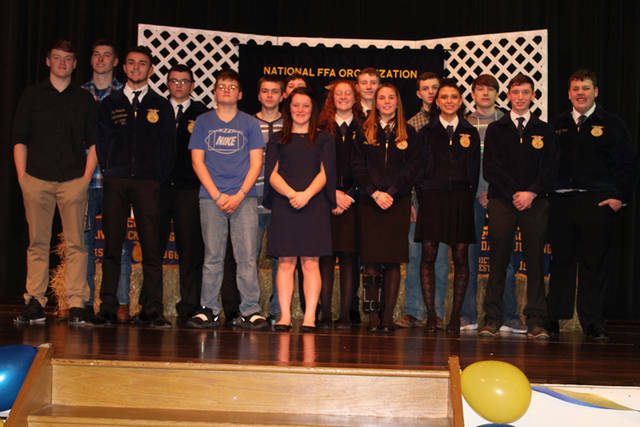 Bradford FFA members (l-r) Wyatt Spangler, Larkin Painter, Jay Roberts, Keaton Mead, Devin Carine, Kyle Kissinger, Dane Shelton, Abby Fike, Nylani Beireis, Taven Leach, Alexis Barhorst, Tevin Felver, Mercedes Smith, Joey Brussell, Aidan Beachler and Justin Bryan are pictured at the group’s banquet. Members of the 2019-20 Bradford FFA Officer Team include (l-r) Dane Shelton, Keaton Mead, Nylani Beireis, Mercedes Smith, Alexis Barhorst, TJ Brewer and Jay Roberts. 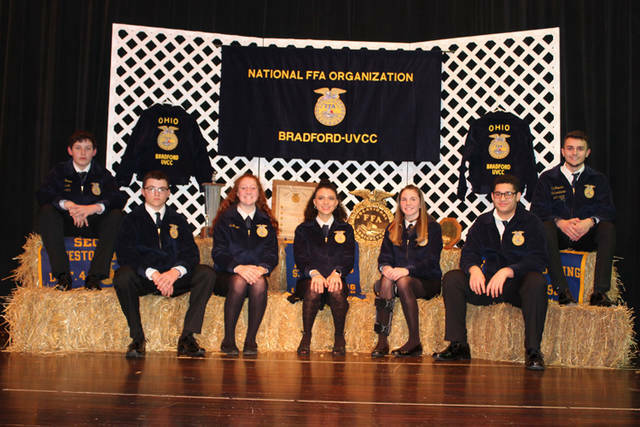 BRADFORD – Bradford’s FFA gathered together for its third annual banquet during which many members were celebrated for their accomplishments. Food and a silent auction to raise money for members to attend FFA camp were part of the night along with CDE competitors, Greenhands, chapter degrees and the old and newly installed officer teams being congratulated on a successful year. Ohio FFA state Sentinel Mallary Caudill gave a speech about how her big imagination and expectations as a child led her to her success as a state officer now. Awards given during included Greenhand and chapter degrees, Alexis Barhorst named Star Greenhand, Justin Bryan named Star Chapter Member and Jay Roberts and Mercedes Smith named Star Juniors. In addition, Honorary Chapter FFA Degrees were awarded to Bradford Schools Treasurer Carla Surber and Bradford Schools Assistant Treasurer Melissa Kommer. Finally, the 2019-20 chapter officer team was inducted into their respective positions. The team includes Jay Roberts as president, Alexis Barhorst as vice president, Nylani Beireis as secretary, Dane Shelton at treasurer, Mercedes Smith as reporter, TJ Brewer as sentinel and Keaton Mead as student adviser.